There is very little at stake in this game in group A in the Eurocup, so it is hard to predict what we will see unfold in this game. However, you have a team at the top of the table with a 6-1 record and a team at the foot of the table with a 0-7 record so you wouldn’t think it would be too difficult to determine the overall flow of the game. Given that Gran Canaria are currently the leading scorers in the competition with an average of 95.9 points per game, we should see plenty of action. The Spaniards also lead the way with assists, 23.3 assists per game and steals, 9.4 steals per game, so they have plenty of good form this season. They also managed a 75-98 win in Skopje earlier on this campaign so they know they have what it takes to take care of this opposition. Kyle Kuric has provided an average of 18.3 points per game so far this season for Gran Canaria and he has been backed by Pablo Aguilar and Sasu Salin both of whom have made it into double figures. It has been a tough season for Skopje who are yet to win a game and who will bow out of the Eurocup at the end of this match. A major problem has been the fact that the side has provided an average of 92 points per game which is the second-poorest record in the whole of the tournament. Xavier Thomas has performed well, providing an average of 16.8 points per game while players like Stefan Sinovec, with an average of 13.3 points per game and Josh Scott, with an average of 12.1 points per game have also performed well at times. It is unlikely the away side will grab a win in this game but they will look to say goodbye in an appropriate manner. 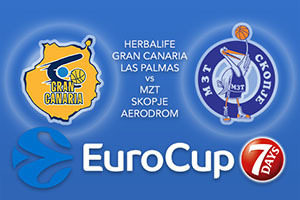 Take MZT Skopje Aerodrom at +22.5 which is provided at odds of 1.90. If you are keen on the Over/Under market, look to go UNDER 172.0 which you can find at odds of 1.90. Bet Now!